Keeping up with the Jones' has become a real need for venues where impressing the customers is key in generating repeat business. Nowhere is that more apparent than the hospitality industry, where having modern, innovative technology can lure patrons to relax at a neighborhood bar or a distant hotel. "With flat panels, everything is growing so fast that everyone is jumping on the bandwagon," said Derrik Lam, director of mounting solutions for Peerless Industries. "If one facility has a flat panel and mount, then the next one wants something to out-do that, something with a little more functionality. You still see a lot of flat and tilt mounts because they're relatively inexpensive and easy to install. But when someone wants to have something with a little bit more pizzazz, they'll use things with more features." For Peerless, that means articulating arms, which provide users with ample flexibility. Introduced this month, its MM860 is a motorized wall mount that allows remote-controlled position adjustment of tilt, pivot, and extension of a flat panel screen up to 60 inches and 180 pounds. Using a universal IR remote or RS-232-compatible touchpanel control automation system, viewers can move the screen to a desired viewing angle or to one of the pre-set positions. 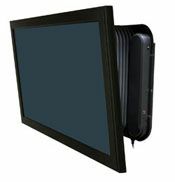 The MM860 extends the screen up to 12 inches from the wall, swivels from 20 degrees to 32 degrees (depending on screen size), tilts to 25 degrees down and 7 degrees up. Though many design aspects are considered for the end-user, in many instances the installers are also a focus. In an effort to minimize the installation time of its projector mounts, Chief Manufacturing recently introduced its Speed-Connect Series. Built to work with the RPA Elite Series of projector mounts, the Speed-Connect Series includes: a 1.5-inch NPT adjustable extension column with a notched design that includes flow-through cable management, with a cable exit port; a newly-designed ceiling plate with integrated cable exit port for a clean installation; and an installer-friendly, lightweight suspended ceiling kit and ceiling replacement tile kit which includes Chief's WireVice cable suspension system for quick tie-off and adjustment, plus a TwisTile ceiling tile cutter for piercing quick, circular holes in the tile. "We're focusing our efforts on making the installation process easier on our installers," said Laurie Englert, director of marketing for Chief Manufacturing. "We've done some field-testing with the RPA Elite and we're seeing a tremendous amount of time-saving for the installer. There used to be a number of adjustments to get the registration right, and now they literally just do that with a screwdriver." Much like display and projector mount solutions, equipment racks are constantly evolving to meet the needs of installers and end-users. Aesthetics and value remain at the forefront, but intelligent design aspects that remedy space, cable management, and accessibility troubles are also growing in demand. One such solution Middle Atlantic unveiled this year is its WR Series of stand-alone roll out rotating rack system. The WR consists of a detachable rack frame that is housed in its own protective host enclosure. By allowing installers to roll the rack out and rotate it 60 degrees for easy access to rear equipment connections, the WR Series provides an effective solution for rooms where it is difficult to provide space for installers to work behind the rack, saving a minimum of six square feet of space per bay. Lowell's addition of the LPT Series to its catalog of rack solutions is another option when space is of the essence. A pull-and-turn mounting system for built-in wall and millwork applications, the LPT Series features four heavy-duty slides for smooth pullout access to equipment, pushbutton lock and release that allows the device to rotate 60 degrees or 90 degrees, and the rack itself may be removed from the turntable as an installation convenience allowing equipment to be shop-mounted and wired while a field team mounts the turntable base into a wall or cabinetry. Once space has been considered, organizational and safety concerns are high on the list. As the varied types of electronics that are placed in a rack increases, so do the cables. In the past a rack may have contained only power amps or signal processing equipment. Now a rack might house power amps, signal processing gear, source devices, a server, and more, with a list of cables including coaxial, Cat-5e, fiber, and speaker, plus control wire and AC power. All the different pieces require different considerations. "We have to provide the means for the contractor or installer to allow all of those things to play nicely together. You need to make sure that there's sufficient cooling and cable management," said Tracy. One move has been towards deeper rack, but more specifically the need to develop efficient cable management. Middle Atlantic's WR Series features telescoping lacer bars in the rear of the enclosure, slots in the upper rack frame accommodate Velcro ties, and the frame features pre-punched rackrail brackets for built-in cable management. Ergotron's LX large display cart provides the versatility to move the display to the audience, transforming any space into a media center-creating a meeting, presentation, or education space out of any area. The LX cart can be put away when the need for presentation is over. It offers 20 inches of height adjustability and integrated tilt capability, making it ergonomically appropriate for standing or seated audiences, even when sitting on the floor. The new universal swingout arm, the AM250, is designed to pull displays up to 18 inches from the wall and retract to less than five inches. Additionally, the mount allows the display to tilt down 10 degrees and pivot to the left or right 45 degrees. The AM250 features an open design that enables easy cable management and gives installers added flexibility when placing power/signal boxes. OmniMount Systems' Moda wall furniture system provides a solution to those who require ample and adaptable cable management for a new flat panel-based home theater system. OmniMount's Moda wall furniture system is an easy-to-install, aesthetically pleasing, and functional wall furniture for the do-it-yourself consumer that also includes premium, integrated cable management, thus eliminating the need to re-wire existing power sources and/or conceal component cables behind walls in order to eliminate unsightly dangling wires. Tripp Lite has introduced a variety of new SmartRack enclosures and open frame rack systems in heights from 25U to 47U. Designed to accommodate all standard 19-inch rackmount equipment in an adaptable, heavy-duty cabinet, SmartRack enclosures are available with or without side panels. They can be configured to order, complete with power, cooling, cable management, and KVM options, while standard pre-configured solutions are available for ordering as a single SKU. The new addition to Sanus Systems' VisionMount line of wall and ceiling mounts is the VMPR1, a universal projector ceiling mount designed to simplify installation. Model VMPR1 is recommended for low-profile flush-mounting applications; it fastens to the ceiling with a heavy-duty flush mount plate. It incorporates independent roll, pitch, and yaw mechanisms. Mustang has added spider mounts to its line of projector mounts. Installers can create a low-profile design with the Mustang MT-SPPROAV's 1.5-inch adapter, and users can adjust the extension arm from 2.5 to 12 inches with its slide adjustment lever. The Mustang MT-SPDROPCEIL combines a universal adapter bracket and a false ceiling plate into one mount. It has a safety lever to protect against theft, and comes with a locking thumbscrew for pitch and yaw adjustments without tools. The new Flat Panel Display Mount and Cart Series offers seven mounts and two carts for LCD and plasma flat panel displays, with universal mounting systems, that pioneer the way flat panel monitors are mounted for the commercial and residential marketplaces. Two of the seven mounts are designed to hold up to six small format monitors that can be attached to either a wall or desk. SeaLand, manufacturer of Moview products, has developed a line of fully articulating LCD projector mounts with technology that allows adjustment and articulation of the projector without knobs or tools. The mounts are compatible with 90 percent of LCD projectors on the market.